RoofScan.ca is the first company in Mississauga, Toronto and the GTA to couple training in Thermography with years of roofing expertise through Roof Maintenance to detect and fix your commercial roof leaks or issues. We serve Mississauga, Toronto and the GTA in commercial flat roofing needs with lasting quality and competitive pricing. RoofScan.ca strives to keep your roof performing beyond its best by actually extending the life of your roof by up to 300%. Our experience, technology and modern up-to-date training allows this to be a goal we continuously achieve when taking care of your commercial roof. 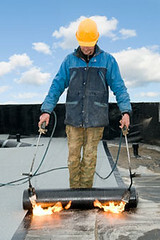 We not only provide a precise scan of commercial flat roof services to detect and eliminate your roof leaks or damage, but complete roof maintenance services as well including re-roofs, 24 hour emergency repair, roof surveys, new roof applications, roof analysis, maintenance reports and preventative maintenance programs. We have the knowledge and expertise to take your roofing problems or needs from start to finish! We Inspect your commercial roof – Both visually and using industry-leading infrared scanning technology. We Consult – We listen and work to fit you and your businesses individual time and budget. Minimizing lost production time and making sure you get back to business as usual without unnecessary delay or expense. Perhaps you are looking to review work that was previously done to avoid future roof problems? We can assist in that area as well. We Repair – Our experts at Roof Maintenance have years of experience and hundreds of satisfied customers having faced a wide variety of roof problems. RoofScan.ca infrared roof technicians are experienced in all types of flat roofing material (BUR, EPDM, Metal, TPO, or Modified Bitumen) meaning they are highly qualified at finding and permanently eliminating your roof problems. We Maintain – Our preventative maintenance plans ensure you get the most out of your roof. Semi-annual or annual Infrared scanning inspections keep on top of any new roof leaks festering in your rafters and extend the longevity of your roof up to three times its current life expectancy. We Warranty – We stand by our workmanship and have experience dealing with both manufacturer's and corporate insurance claims to help you in case any type of roof problem arises. Other roofing contractors leave you to squabble with the giants alone – we stand with you to remove all of your roof problems. We Can Save You Money – Our pioneering combination of technology with good ol' know-how means we provide high quality, lasting work. You will also be assured that you are receiving information about your roof leak or problems that is surgically precise. We also provide supporting documentation in the form of images which allows you and your company to see for yourself. This can translate into your businesses repair costs being lower. We know that the bottom line matters. From the initial inspection both visual and infrared; through consultation to fit your individual needs and budget, expert repair, to preventative maintenance plans, and a full warranty for our workmanship. Whatever your roof problems are, let RoofScan.ca take care of it. We are you final roofing solution. © 2014 IntraGreen Roofing Systems Inc. All rights reserved.